Soufeel Mother's Day Offer & 10% off your order! I've reviewed Soufeel before on my YouTube channel and I just noticed that their website has a Mother's Day offer! Now, in the UK we've already had our Mother's Day, but in the States it's still on it's way. Still, we can reap the rewards of this amazing Soufeel offer. With any order made on soufeel.com you can get a free personalised photo charm! Put in a photo of your loved ones or pets and have them on your wrist at all times. Don't forget, if you used the code 'SARAH' you can get 10% off your order too! Every year the WWE rolls up on the shores of the UK. Nine times out of ten it is the Smackdown brand that makes itself at home in Sheffield. This time was no different. This was my fifth time of seeing the WWE live in Sheffield. I went last year and found it to be a little bellow par. So needless to say, I didn't have the highest of hopes for this event. 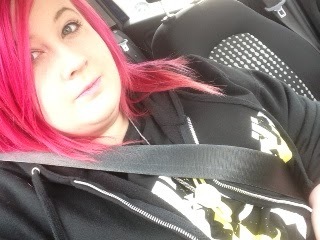 I made my way through the hoards of children in John Cena t-shirts to find my seat, praying I wasn't sitting next to a hyperactive 6 year old that would cry when he realised that his hero wouldn't be there. The show started with Lillian Garcia asking everyone to stand while she 'sang' God Save The Queen. Very few people listened and even fewer stood. It was announced the first match would be an eight man tag team match. The mood quickly was lifted as Santino Marella's music hit. I must admit, he was a good way to start the show. A good giggle is always a good way to start off a show. Then 3MB's music hit. Of course everyone booed - they're heels, right? Wrong. Apparently tonight Jinder Mahal and Drew McIntyre are playing the roles of faces. Then out came Alex Riley, who hasn't even been on TV for months, but seemed to get a half decent pop from the crowd. This 'thrown together' team would face Primo & Epico & The Prime Time Players. After a good few giggles from Santino, the match ended with the Cobra. Very predictable, but quite an enjoyable match, made even better by a sudden interruption from The Shield, who destroyed the victors and vowed to win their match against Sheamus & The New Age Outlaws. Next was Fandango vs Ted DiBiase. There was very little 'Fandangoing' from the crowd, which was a disappointment and that match was quite short. It was clear the match was mainly put on for the crowd to hear a man pronounce his name on a microphone. Still enjoyable though. Next Hornswoggle was introduced as the special guest announcer for the Diva's match. Natalya got a good pop from the crowd and Alicia Fox got a very indifferent response. It's hard to tell who's a face and who's a heel in the Diva's division these days so can you blame people? The match was pretty decent, with Natalya getting lots of chanting from the crowd. Nattie won the match with the Sharpshooter and had a little post match celebration with Hornswoggle. Next came the snooze match of the night. The Great Khali vs Mark Henry. Neither man is known to be a good 'mover' so this match was inevitably slow. There really is nothing to report on this match except Mark Henry won with the Worlds Strongest Slam. Next was the match that was billed as the main event, but had been bumped down the card, possibly because there was no longer the World Heavy Weight title on the line. Alberto Del Rio vs Jack Swagger in a no DQ match. The segment started with Zeb Colter giving his usual racist speech before Riccardo introduced Alberto. Del Rio got a pretty decent pop and the match wasn't half as bad as I imagined it would be. There was a kendo stick, chair and a table - everything you'd expect, really. Del Rio won via a cross arm breaker. After the interval came the match for the Intercontinental Championship Wade Barrett put his title on the line against a personal favourite of mine, Justin Gabriel. This was a perfect example of how a home crowd can suddenly make you a face. Wade got the crowd hyped up while Justin, despite being the 'face' in this situation seemed to mainly get boos. Justin gave some decent high flying moments which were much needed on the card, but inevitably Wade won with a huge upper cut. Next was The Big Show vs Randy Orton. This match could have been a good one, but Big Show spent at least ten minutes refusing to get into the ring and start the fight, instead deciding to have arguments with children on the first few rows. Eventually when the match started it was a back and forth affair. When Big Show hit the choke slam there was a huge intake of breath from the 8 year olds in the arena, but of course Randy kicked out and eventually hit the RKO from 'outta nowhere' and got the win. Randy took his time to circle the ring and sign autographs and slap hands with fans in the front row, making sure he didn't leave anyone out. Next was the main event and the one I was looking most forward to. Sheamus & New Age Outlaws vs The Shield. First to enter the ring were the Outlaws, to disappointingly little crowd reaction. I'm guessing most of the crowd were kids there with their parents who weren't around to see the Outlaws the first time around, which was even referenced by Billy Gunn himself. Sheamus got a bigger reaction and The Shield got a mass of boos as they appeared close to where I was sitting before making their way to the ring. It felt odd cheering for both sides but I couldn't help it. The match was good, but short. My attempts at starting a 'You still got it' chant fell flat on their arse, but it was genuinely nice to see the Outlaws back in action and not really missing a beat. The match ended when The Shield got disqualified for using a chair. 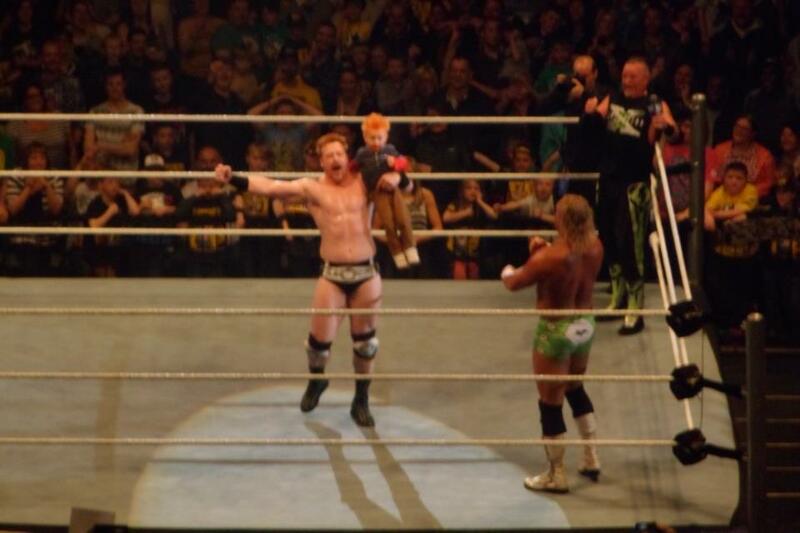 The Outlaws and Sheamus celebrated their victory by picking out a small lad from the front row with ginger hair and got him in the ring. His name was Olly, and he was all kinds of adorable. I think the Outlaws and Sheamus really made that boys night and it was a really nice end to the evenings events. The week started out in the early hours of Monday morning, well 12am to be exact when Wrestlemania began. Being female and being a wrestling fan often gets you either a) picked on because it's not 'girly' (I've had this my entire life) or b) the male wrestling fans will look down on you like you know nothing because wrestling is a 'male sport' despite the fact that there is a whole division dedicated to women who wrestle. This is why I'm thankful for the few males friends I have that I can have a decent indepth conversation about wrestling with. I've been watching it since I was four years old... In other words, I know my stuff and it's nice to have conversations where the 'fake' factor doesn't come into it. Where you both know and understand that, yes, while wrestling can be scripted and the winner is always predetermined, it is still a great for of entertainment. It's like watching Eastenders with big sweaty men. Nice. So, what did I make of Wrestlemania? There were some good points and there were some bad. The highlight of the show for me was always going to be CM Punk vs The Undertaker. It's a clash of childhood me and current me. 'Taker was around when I was four.. with his grey leather gloves. Then the purple ones with his mask. Oh yeah, and not forgetting the time when there were two Undertaker's. Yeah, wrestling is stupid. A place where someone can come in and steal your identity without people realising. Again ,that's another reason why it's like Eastenders. Ian Beales daughter for example. Surely he'd pick up on the fact that she clearly wasn't the same person. Oh no, not in soap land! Anyway, I had a feeling in my bones that Punk was going to be the one to beat the streak, but sadly I was wrong. Deep down I knew it wasn't going to happen. Undertakers streak = DVD sales. Roll on 25-0 the DVD. Vince will be rubbing his hands together with dollar signs in his eyes. I felt as though since losing the belt Punk has been loosing steam. The feud with 'Taker would've been enough to push him to the BIG times. Even people who don't watch wrestling know about 'the streak' and I believe that Punk needed that win. Sure, he still gets the crowds chanting his name even though he's a heel, but I just can't see a direction for him to go in now. Who can he feud with? WWE have said they've finished up the Cena feud, so that means no more title shots for a while, but with the possibility of Cena turning heel (If that EVER happens) who do the WWE have? It wasn't long ago they said they didn't have enough decent heels, but now I think they have too many and not enough faces that the crowd can really get behind. Don't get me wrong, I LOVE Punk as a heel, but a face turn would be something to really get the steam rolling again. My opinion. There were few other matches that actually caught my attention. FaaannnDaaannnGoooo certainly didn't deserve to win over Y2J on the grand Wrestlemania stage. Someone said recently 'Jericho loves losing. He's got that used to making other people look good he just doesn't know when to stop' and it's true! I'd love to see Jericho win some matches and maybe have another title reign before he retires into the Hall Of Fame. HHH vs Brock was predictable and didn't really keep my attention all that much and to be honest, neither did Cena vs Rock Part 2. It was clear that super Cena was going to win this time around, but as there were rumours floating around of a possible heel turn I stayed watching only to see the exact opposite. Rock & Cena on the ramp holding up each others hands. Every chance for Cena to clock Rock in the face with the belt, but no. It was entirely too nice if you ask me. I used to love the surprise heel turn moments, but there doesn't seem to be that many anymore. Even Punk's heel turn was very slow and not obvious for a few weeks. I just think the event could have been so much better. The Miz winning the IC title on the Pre-Show and then losing it the night after. What's the point in that? I think the creative team need to sort their act out and give us some decent storylines. No, this isn't the Attitude era, but surely there are better writers out there than this? Oh, and the following night's RAW was around a million times better than Wrestlemania itself. The crowd MADE that show. The cheering as Ziggler won the belt were epic. I hadn't heard a crowd like that since Punk won the WWE Championship in front of his home crowd at Money In The Bank. Amazing. I also feel like I need to post this... Chris formerly of Editors chats about Wrestlemania. Could this be more perfect? OOTD - Galaxy Print & Mint.. and cats! Here's today's Outfit Of The Day!